MABLE for Four! Provides an action adventure for all on this unbelievably massive product. The Great Big Mable provides over 50 handles and protective EVA foam pads for additional comfort. Also includes two towing points for added entertainment! 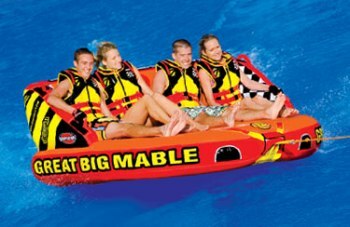 Great Big MABLE will marvel, amaze, baffle, and greatly Exceed expectations for any foursome! There's nothing quite like the Great Big Mable. She's one of a kind. Great Big MABLE Four person boat tube! You will have a blast on the water towing this best selling mable tube!